This is a common subject among brass players but I’ve never been that much of a “gear junkie” myself. 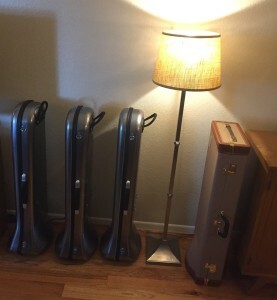 I’ve owned 6 different trombones since since I started playing at age 8, and only one I currently still own is my Edwards T302 Jazz Trombone. I play mostly jazz and commercial music these days so it’s a great fit for me. I’ve loved the sound and feel since buying it on the spot at the 2004 IAJE in NYC. 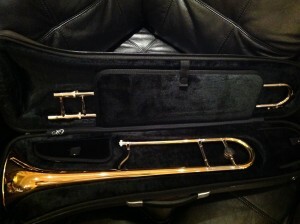 However, every horn seems to have a “problem” note or two and possibly some other issues as time goes on. 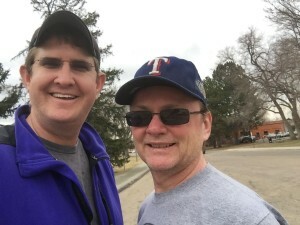 I inquired about trying a few horns out for an extended trial period when I got back home to Denver. 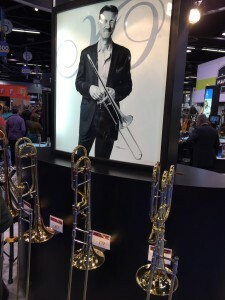 The local representative for KHS America – the distributor for this new pro line of Jupiter called “XO Professional Brass” – is Bob Newhouse and we finally connected on Sat for a trombone handoff (at the Denver Zoo of all places!) I now have 4 brand new trombones here of the same make/model – XO 1632RGL-LT – that I am meticulously playing, testing, mixing and matching. 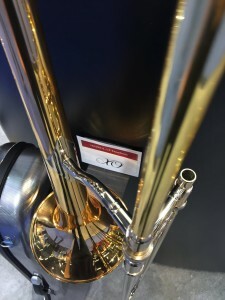 I’m really enjoying all so far but am not yet found a super silky slide, but that my be simply a trombontine work-in-progess as they are really brand new and need some time to lubricate. 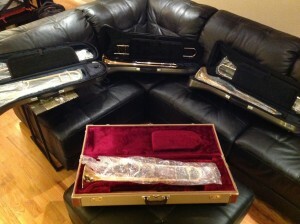 Bottom line – I think it’s beneficial to make the time for a thorough investigation of a new horn. A quick 15 min session in a music store usually isn’t sufficient, although I did buy my Edwards after just 3 separate sessions over 2 days at that IAJE in 2004. And that’s how this XO horn felt after 3 short sessions at NAMM. Conversely, in 1991 I drove from Denver to the Selmer factory in Elkhart IN to spend 3 days trying different configurations of a Bach 16MG which I then played for 13 yrs. So I’ve kind of done it both ways but I’m excited with the possibilities of this new horn and the company staff have been very kind and attentive to my requests. I will let you know what transpires over the next week or so.